March is a wonderful time to photograph the change of seasons. Here on the West Coast of the US, our weather changes between rain, sun, and hail. Bulbs start to poke out of the soil in February, and the daffodils are blooming. 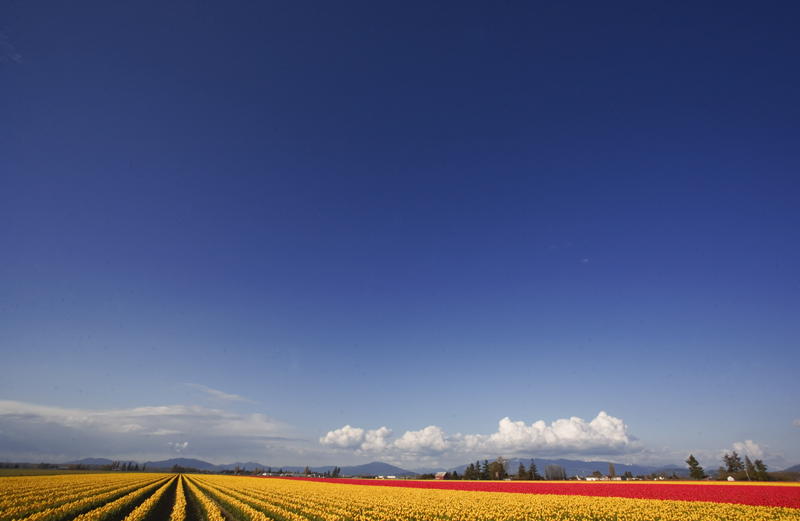 In April, the Skagit Valley holds its annual Tulip Festival. The photo above was taken in the afternoon, on a sunny April day. 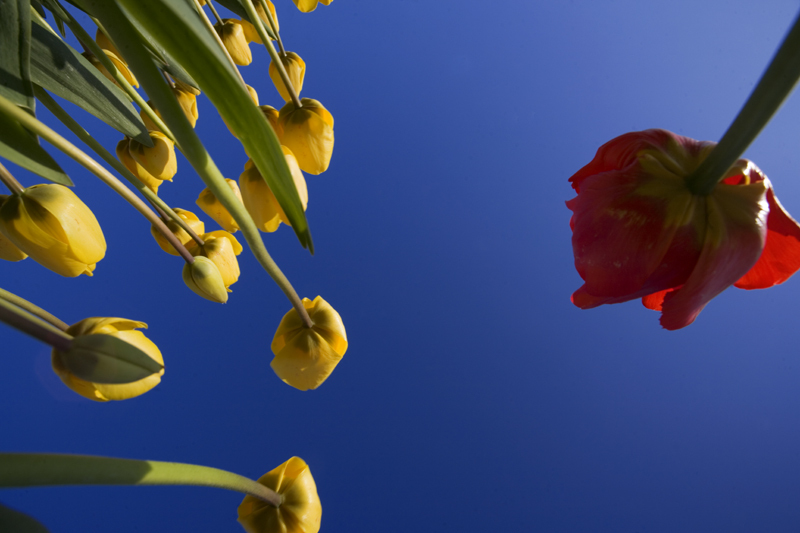 The use of color and perspective make for interesting floral photographic images. This one was taken from below (on the ground) looking up towards the sky. I held my camera on the ground, pointing it up, with a wide-angle lens set at 17mm (full frame sensor). I wanted to focus on the idea of color, and the concept of being unique in the crowd. Below is a shot of the fields with a sense of the surroundings. In this image, I used a wide-angle lens set at 17mm (full frame sensor), set the horizon line low in the frame, and used the primary colors to define the photograph. My depth of field was F13. For more information about garden photography, attend my class this Saturday at Coupeville on Whidbey Island. It’s the WSU Master Gardeners extended learning workshops for gardeners of all ages. Karen, really enjoy the deep colors, esp. the deep blue of the sky. What elements of your technique and/or gadgets do you attribute this to? Someone has recently recommended to me that I use a circular polarizer to deepen my digital shots. Thank you Matt – I used a circular polarizer filter. It cuts the glare of the sun on the flowers and leaves. By doing so, it brings out the color of the subject. I teach workshops on photo techniques, and getting the most from your camera. Let me know if you would like more information. . .